Huh.... wha.... isn't that what I said?.... I'm confused now..... Damn-it Jim Beam after work! I guess like most homemade projects, mine progresses as time and money allow. The target is to get it on the road by next spring. I haven't gone into some of the endless details of the build, such as all the options I considered for a seat, or the ratio needed for the master cylinder to work the clutch slave, or which performance cams I'm going to fit and so. Because most folks wouldn't be that interested and I don't have the time to write pages and pages. This thread is more of a summary with lots of photos to show progress, with more details of some of the problems I had to deal with along the way. 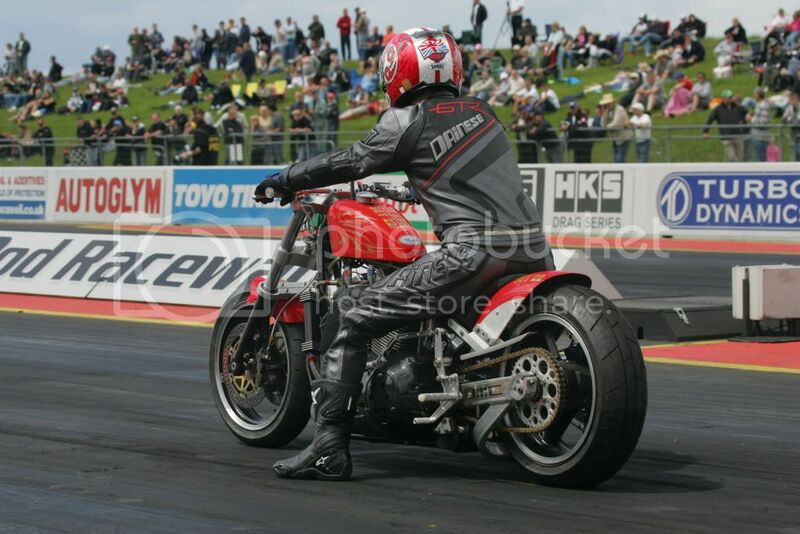 18 months isn't that long lol.. my last drag bike took three years, then again are they ever really finished? Once they are on the road, there are always things I want to improve and change. Actually today I've been to an exhaust specialist and brought back a few metres of 1 3/4 inch stainless tubing and enough bends to make two systems, one for me and one for my mate Tim's XL scrambler.. I think the pushrod covers shown on the motor are different then the ones you originally bought in the first posts... no? The pushrod covers are still the same as when I got the bike, I don't like them and so have bought some new std ones, but haven't fitted them yet. 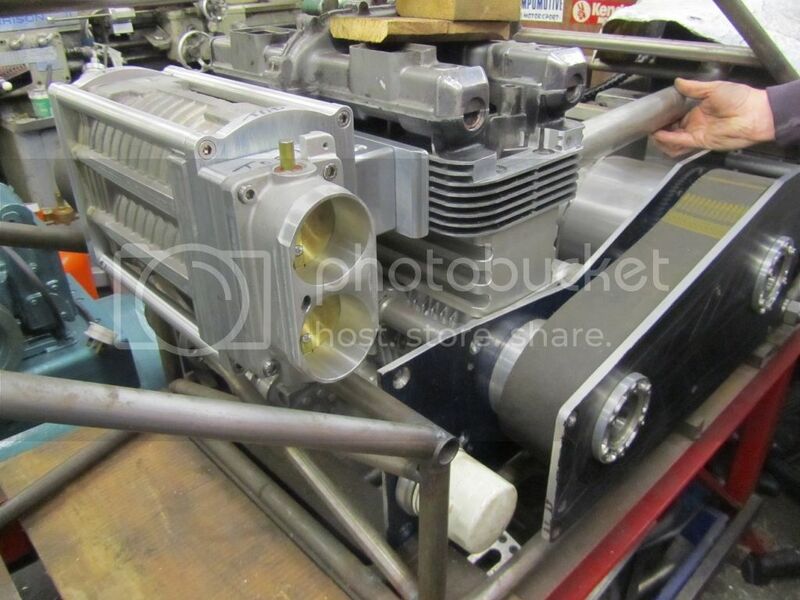 Talking of the motor, it ran fine and had a recent rebuild, but I'll take the heads and barrels off once the dry built is complete and get them powder coated or maybe ceramically coated, not sure yet. It'll also get electronic ignition to replace the points and a set of performance cams, maybe not straight away, but that's the plan. Long term I'd like to make a pair of billet barrels too, but got other projects waiting to do before that.. The Devil you say... and where pray tell, might I find info on that? ok, its getting late here in England, so I'll just just leave you with these that I mentioned before..
My old sprint bike.. Merch 120 motor, with NOS.. 424 lbs and 180 bhp... it was fun.. a road bike now.. 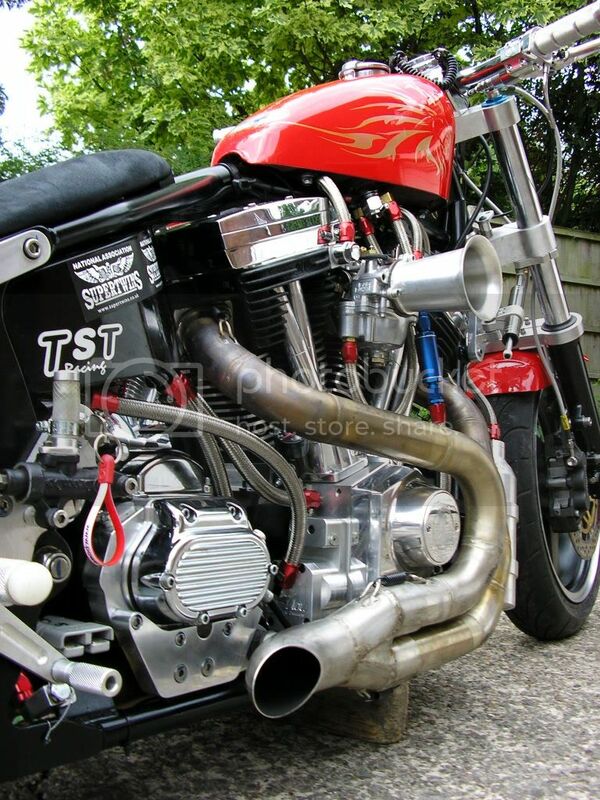 The current (long term) drag bike project I'm building with my mate Jeff .. 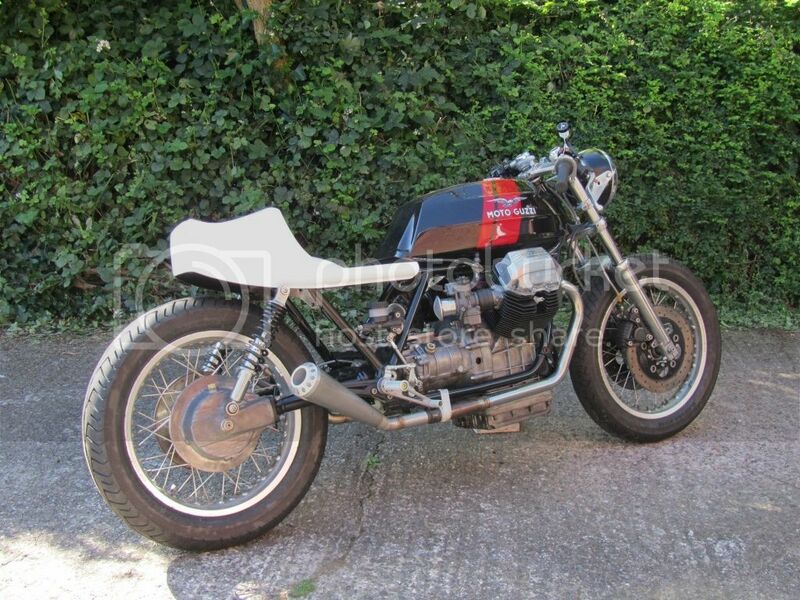 I have a couple of old Ducatis I've restored too, but they are std. Those that would be interested in the details have already read your tech intensive build thread. Powder coating your heads and cylinders has been discussed as to whether it retains heat. While it does retain some heat it is negligible, while ceramic coatings main intention is to retain heat, my cylinders and heads would be the last place I would use ceramic. That's a good point, I mentioned ceramic coating as I've been thinking about having that treatment on another projects exhaust, and I could get it done for free.. powder coating it is then ! I read an article in The Horse where one of their columnists does a test regarding the heat retention properties of powder coating. He powder coated one head and painted the other. then he put them in front of a fan and ran a heat gun through their ports, taking heat measurements as he went. Then end result was the powder coating held in significantly more heat then the paint did, i do mean significantly. I would never powder any engine parts after reading his article and seeing his numbers. I used a decent quality spraybomb hi temp heat for my 59 xlh and its held up fine and looks great. Powder coating of cylinders and heads is done quite regularly with no ill effects. Well im not saying your gonna kill the engine by doing it, but its still a bad idea. These cast iron heads and jugs have a hard enough time trying to dissapate heat as it is, no reason IMO to make it harder.